Those are such lovely clogs! Wherever did you find them?! I find that only owning two pairs of lovely clogs (floral & red) are not quite enough and am always on the hunt for some new friends for my feet! Love the bling on your sweater to! What a lovely project! I love it! 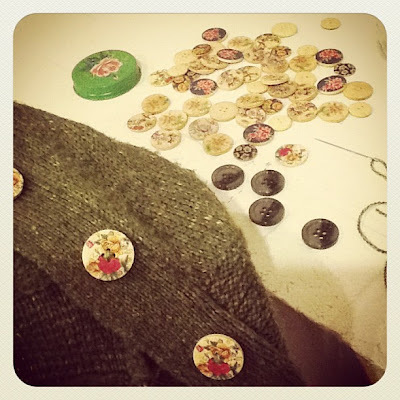 Thanks for that bit of idea, I need to try and bling some of my things, may love using them again! I love adding a bit of bling to my things too. 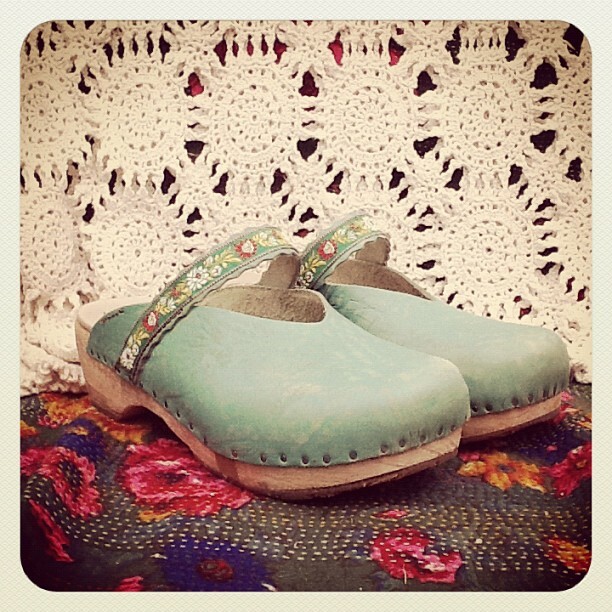 The be-ribboned clogs are now way cute! Those are particularly lovely clogs - even before the granny bling chic fling (delicate placement really - but it rhymed). Where are they from please? Maybe we get to admire those in ole blighty too? Have a lovely weekend Tif. Don't forget what i said about bringing that Mr Sun. Gorgeous changes sweetie, have a happy week. Granny chic bling.. I love it! Eeek! Those clogs are divine! hi Tif, you make me laugh..
"to cheer up something a little tired or lost. ha ha it gets like that sometimes. Love the blinging of the cardi and the clogs. Save yourney across the pond. many thank yous for the 'granny chic bling' love! and yes, they will be travelling across the pond with me, Donna! I would so love for those clogs to live on my feet. Same for the bling. I love your version of bling--much better than scary huge shiny things (though I have a soft spot for little shiny things...).